Toot toot! There’s nothing like the promise of a train ride to get kids and bigger kids all excited. That was just one of the activities on our agenda when we parked Tin Box close to Moors Valley Country Park on the Hampshire-Dorset border. Our weekend home was Grundy’s Farm Camping and Caravan site, not far off the A31 at Three Legged Cross. Also occupying the site are sheep, horses and Shetland ponies, which gave Tin Box Tot plenty to ogle while we were there. Moors Valley Country Park was a 25 minute walk away so we were able to avoid taking the car and paying for parking. Our visit coincided with the Moors Valley Railway Steam Gala, when enthusiasts show off their various steam propelled engines over the weekend. There are also classic cars and steam powered machinery on display. Before we could do anything else, the boys and kids in our group wanted a ride on the model railway. The track has four tunnels and covers one mile, looping around the nearby play areas and travelling along the banks of Moors Lake. The ride takes about 20 minutes – just enough time for the ladies in our party to grab a coffee from the station buffet. After a sneak peek at the play areas while on the train, these were prioritised as our next destination. 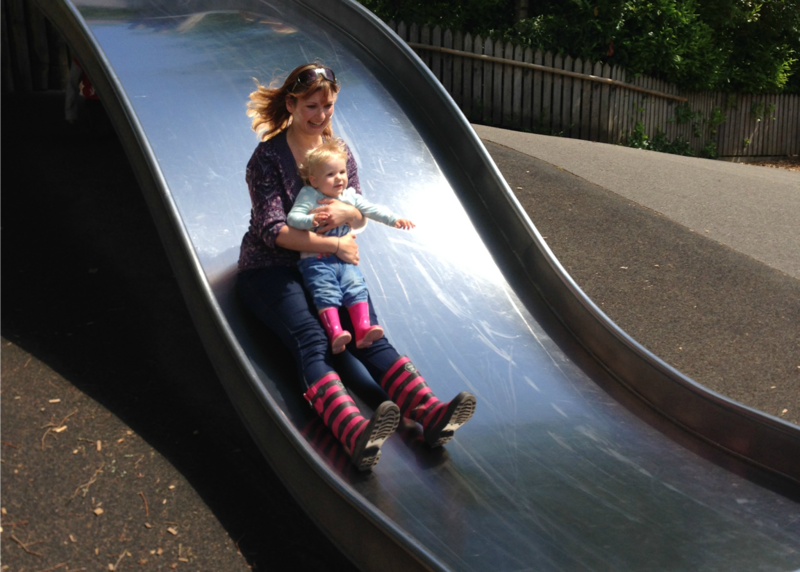 We spent a half hour exploring the Castle and Sandworks area for the younger children – Tin Box Tot loved the slide and sitting in the sand – then we moved on to the Adventure Play Area. This has a zip line, a huge boulder to climb and a wavy slide. Once we had all had our fill of ‘weees’ down the slide it was time for a late lunch. The Visitor Centre has a large canteen and we found tables for six adults and four kids easily (it was about 1.30pm on a sunny Saturday). The food was very nice but maybe a little over-priced. Two paninis with a salad garnish and a cooked children’s meal cost us £16.99. Moors Valley offers a lot for families looking for an action packed day out, with cycle routes, Go Ape for all ages, play trails and wildlife watching. We only got to sample a small proportion of its attractions, so there will be plenty more to do on our next visit! I love hearing what people think about my blogs, so feel free to add a comment below. You can also follow me on Bloglovin, and find me on Twitter, Facebook and Google+.